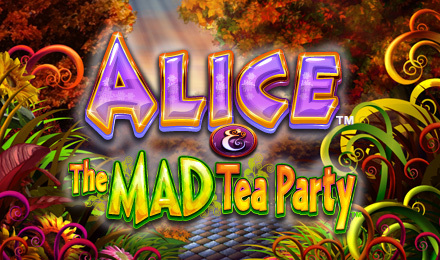 Alice and the Mad Tea Party Slots | Get 60 FREE Spins! Take a journey with Alice in Wonderland and play Alice and the Mad Tea Party Slots! There are loads of bonuses including FREE Spins, multipliers, and special feature games that will boost your wins! Watch out for the rabbit hole when you play Alice and the Mad Tea Party Slots! Join all your favourite characters including Alice, Cheshire cat, the Mad Hatter, and the White Rabbit as you spin to Win this entertaining slot! Try to land 3 or more Alice symbols and trigger the Super Mad Respin Feature where you get to pick teapot symbol to reveal your prize! Activate the Mad Tea Party Free Spin Feature with the help of the Feature symbol for 6 free spins with extra benefits such as multipliers, extra wilds, and more! Plus, there are 5 special features to help boost your wins – the Alice, Cheshire cat, Queen, Caterpillar, and Mad Hatter features!